The purpose of this text is to help the student and structural engineer* design reinforced concrete buildings efficiently, correctly, and accurately. Insofar as possible, material is presented in logical order as the structural design would be prepared in a design office. Necessary deviations are made to explain basic concepts before they are used in design. Students and practicing engineers should thoroughly understand these basic concepts before applying-design procedures in practice. Structural investigation consists of predicting the behavior, such as load-carrying capacity or deflection, of a structural member, frame, or system when all necessary information is given. Presumably there is only one correct answer. Structural design consists of selecting the size, shape, materials, and details of a structural member, frame or system when the required behavior, such as load capacity and other conditions, are given. Sometimes it is necessary to employ an iterative procedure in which a design or certain conditions are assumed and then investigated. The design or conditions are modified based on the first investigation and are then investigated again. Iterations continue until convergence, that is, until the investigation indicates that the assumed design or conditions are satisfactory but not oversized. However, for efficiency, design should proceed without iterations. Design is the opposite of investigation. In design, there are many correct solutions. Perhaps- no one solution is the “best.” Design is by far the most common activity of practicing structural engineers. Some people consider design more difficult than investigation because of the many options involved, but it need not be so. Description of investigation procedures sometimes must precede description of design procedures, but the latter is emphasized in this text. For efficiency, design aids should be compact, pertinent, and few in number. Most preferable are aids that can be committed to memory for conditions most commonly encountered. It is the intent of this text to present graphs and tables that will illustrate visually the effect parameters have on final design. Some graphs and tables in Appendix A will also serve as design aids by giving values useful in design without further computation for situations most commonly encountered in design practice. Likewise, simplified or short procedures should be significantly shorter than complete or long procedures, without sacrificing safety or construction economy. The design should move quickly and directly to determine required information while promoting the engineer’s understanding of structural behavior. To facilitate reaching these goals, all chapters of this text list objectives for the subjects included in the chapter. A student should refer to the objectives again after having studied all material in the chapter. Also included are suggestions for short procedures, where appropriate, and an analysis of the premium to be paid in construction cost, if any, for use of such procedures. The structural engineer’s objective in designing a structure is to prepare contract documents that describe the reinforced concrete structure to be constructed. These documents should be completed with a minimum of time, cost, and effort while meeting all other design objectives. The engineer’s objective is not to make calculations or prepare a design, per se. However, some authorities (e.g., the engineer’s supervisor, the owner, or the building department) will require proof that this was done in a satisfactory manner, so it behooves the engineer to prepare design computations in a competent manner for such an eventuality. Only cast-in-place reinforced concrete is covered in this text. It does not include precast, prestressed, or composite construction or related subjects such as determination of loads and rigorous methods of moment distribution. English units are used throughout the text because it is unlikely that metric or SI units will be adopted or be used to a significant degree in the United States in the near future. Conversion tables are included in Appendix D.
Although engineering principles are the same all over the world, this text is directed toward achieving the maximum economy of design and construction of reinforced concrete structures of moderate size or smaller in the United States. Design procedures appropriate only for tall buildings (such as the P-delta method of evaluating column slenderness), or appropriate only for advanced design using computers (such as the equivalent frame method for analyzing two-way slabs), or used only by those preparing design aids (such as balanced conditions in columns), are not discussed. Instead, reference is made to other publications. Also, calculation of cutoff points for positive moment bars in flexural members is not covered because I am opposed to the use of short bars. Much calculation effort is required to determine length of short bars, and their use risks misplacement with potentially serious consequences. 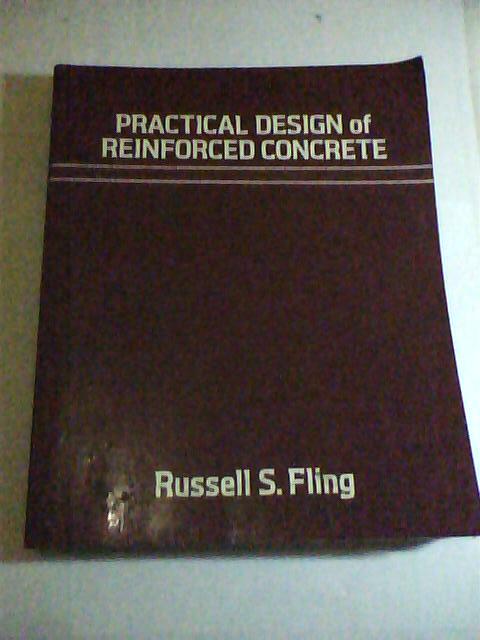 In this text, I have introduced some subjective opinions distilled from many years of practice as a structural engineer engaged in the design of a wide variety of structures in reinforced concrete and other materials. Some of these opinions are found in the footnotes, which are intended to facilitate the task of understanding the engineering principles involved, as well as to present practical observations on construction of reinforced concrete. I have tried to distinguish between established theory on which there is general agreement, and personal opinion, which is still open to debate. References given at the end of each chapter direct the reader to detailed information on important subjects. Reference lists are not complete but provide only an initial supplementary reading for those interested in pursuing a subject further. Some references are classic papers, which, though 10 to 20 years old, still provide the most definitive discussion of their subject. Extensive reference is made to American Concrete Institute (ACI) Building Code Requirements for Reinforced Concrete (ACI 318-83). Hereafter, it is referred to as the ACI Code, or simply, the Code. Practicing structural engineers should obtain a copy of the Code and the accompanying commentary for use in design practice . * The ACI Code has been widely adopted by many governmental jurisdictions throughout the United States, as well as by many foreign countries. In the text, those equations used most often in design (prime equations) are emphasized by being enclosed in a box. Prime equations and their derivations should be memorized by practicing engineers. Certain other equations are as important as prime equations but are not used as often in design and therefore need not be memorized. Some equations are secondary equations used in deriving or supporting prime equations. I welcome any suggestions for improving the wording, correcting any errors, and including or omitting any material in future revisions. I may be contacted through the publisher, John Wiley & Sons. 1. ACI Committee 318. Building Code Requirements for Reinforced Concrete, (ACI 318-83); Commentary on Building Code Requirements for Reinforced Concrete. American Concrete Institute. Detroit, Michigan, 1983.